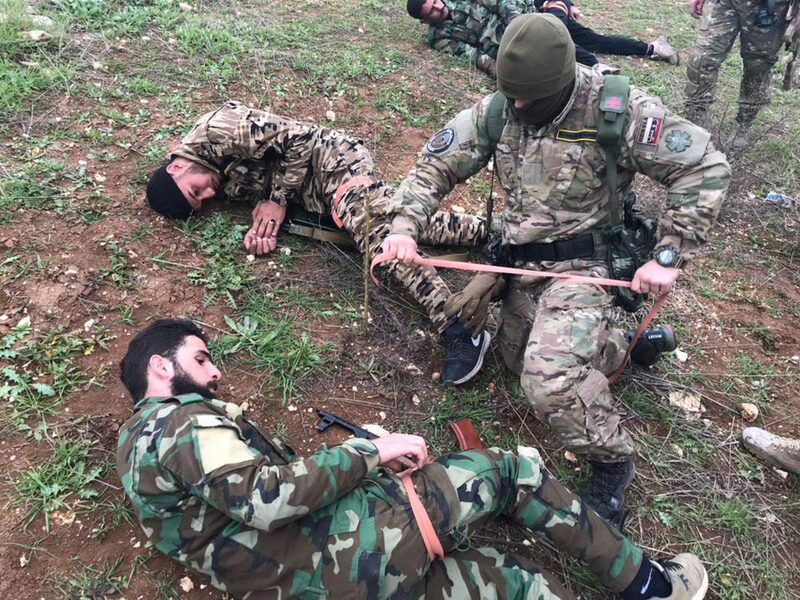 Recently surfaced photos and videos surfaced show a Russian-Ukrainian company training a pro-Syrian government Palestinian group “Liwa al-Quds”. Unlike the so-called “Wagner PMC”, this company better fits the description of a private military company. We traced the origins of Vega’s work in Syria and the people behind the organization. On January 20, former pro-Kremlin ANNA News reporter Oleg Blokhin started posting photographs of military instructors wearing St George ribbons (a pro-Kremlin nationalist symbol) and Russian flag patches. Later he posted photos of the same instructors with patches of a private military company “Vegacy Strategic Services Ltd”. 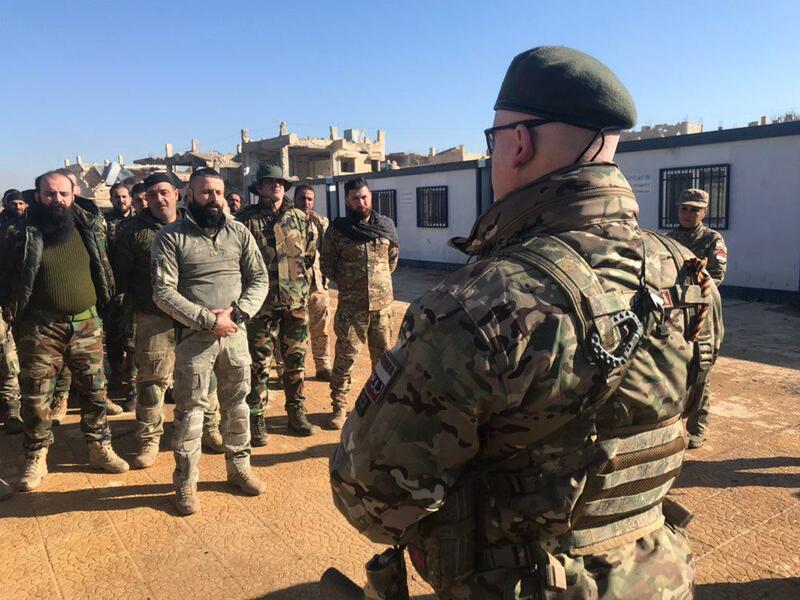 The photos and videos posted by Blokhin suggest Russian-speaking instructors have been training a Syrian Palestinian pro-Assad group Liwa al-Quds. We have covered this group’s close cooperation with the Russian forces, in particular during the 2016 siege of Aleppo. Since then, the group’s cooperation with the Russian military strengthened even further: in 2017-2018, Liwa al-Quds, supported by the Russian Air Force, took part in all major offensives by the Syrian opposition and IS militants. According a 2016 article by analyst Amir Toumaj, the group, whose name means “Jerusalem Brigade”, plans to continue their fight beyond Syria to “liberate” Jerusalem and the entire Palestine. The group was also seen to employ child soldiers, which is a violation of international humanitarian law. 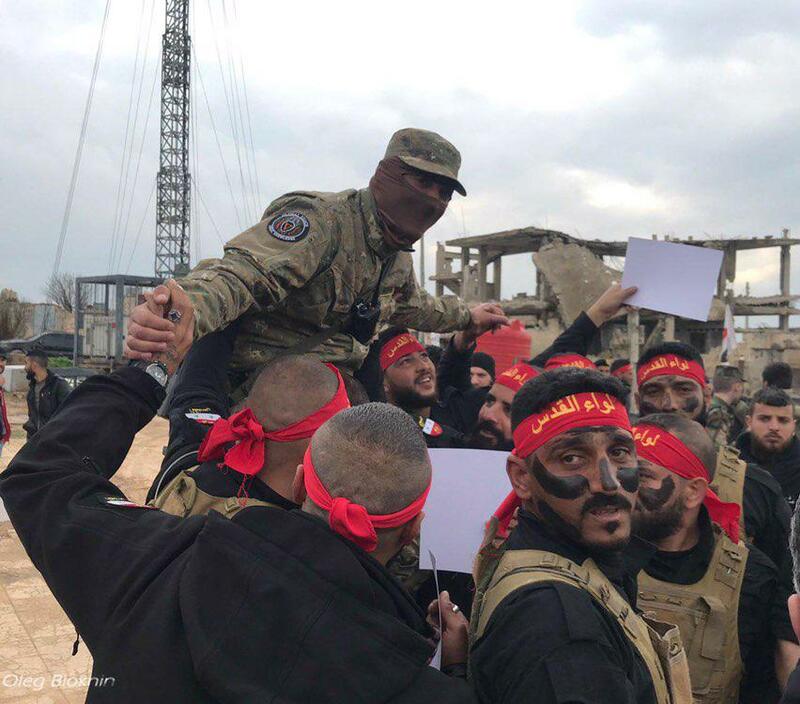 According to a Lebanese online media outlet “Al-Modon”, in 2019 Russia’s support to Liwa al-Quds grew significantly: the group got hundreds of new recruits who were trained north of Aleppo city. According to Al-Modon, Liwa al-Quds is involved in the proxy Russian-Iranian conflict within the pro-regime coalition on the Russian side. 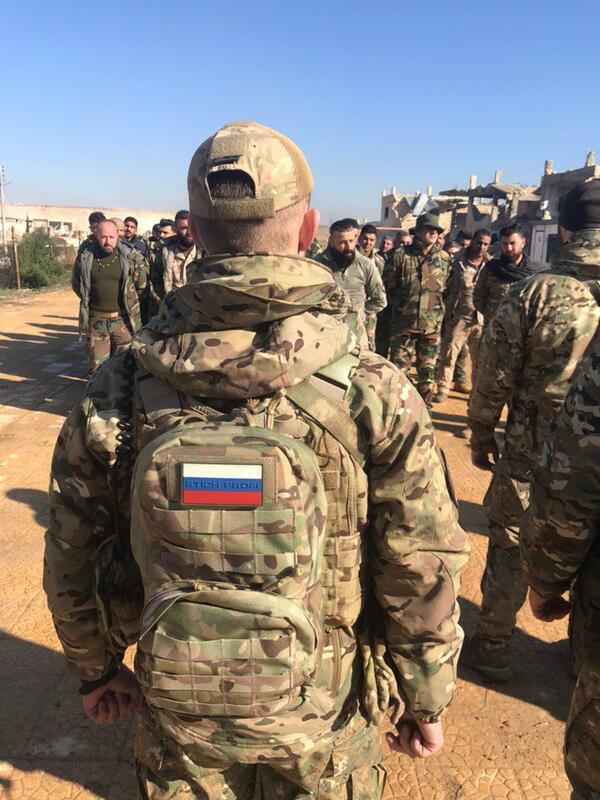 On January 25, Oleg Blokhin published a post where he told that the “selection and staffing of cadet groups” had ended and that they were being sent for training to different parts of the country: Deir al-Zor, Latakia mountains, Hama, Idlib and al-Tanf. 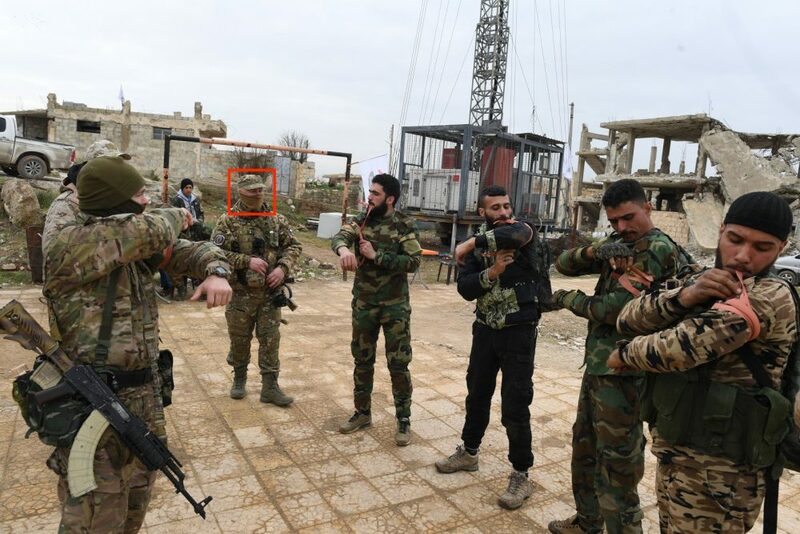 On March 25, DFRLab geolocated several photographs of the training and found out that it took place north of Aleppo, on Tell-Handarat hill (which is mentioned in the Al-Modon article). The photographs and videos of the training exercises, where men can be heard speaking in Russian, were posted in Blokhin’s accounts until mid-March. In 2017, Blokhin authored a hoax on the so-called “Turan PMC”, which was allegedly staffed with Muslims from former Soviet countries. However, unlike Turan, Vega turned out to be a real private military company. The instructors’ patches suggest they are part of Vega Strategic Services (not Vegacy). A company with this name was created in April 2011 in the Ukrainian city of Mykolaiv by former members of international elite and special forces of Russia and Ukraine, per the description enclosed to the list of companies who signed the International code of conduct of private security agencies. Vega Strategic Services offered security to individuals and companies in high-risk environments, as well as maritime security. A year after the company was founded, it moved to Cyprus and changed its name to Vegacy Strategic Services Ltd. It was registered in June 2012 and terminated a year ago (May 2018), according to the Cypriot register of companies. At the time, the company’s 50% owner was a Ukrainian national Anatoly Smolin. He was also listed as its director. The second owner is hidden behind a murky company Draugas Consulting Ltd. 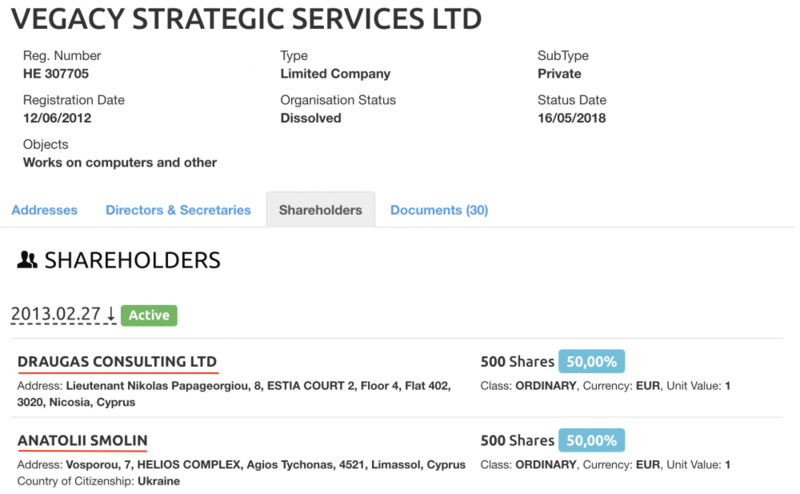 According to the documents, its only subsidiary is Vegacy Strategic Services Ltd. Draugas Consulting Ltd, in turn, was owned by another Cypriot company that had the markings of a shell company — Lexpro Shareholding Services Ltd, which also services many other companies. Companies linked to Vegacy Strategic Services Ltd work both in Russia and Ukraine. The company’s head office is in Cyprus, another is in Moscow. It has representatives in Syria, the United Kingdom, Germany and Thailand. In the UK and Germany, Vega is represented by separate companies. In Germany, it is STASO GmbH, which specialises in maritime services. Vegacy Strategic Services Ltd. is listed at the company’s website as its sole partner responsible for maritime security. The company’s representatives told CIT they had no signed contracts with Vegacy Strategic Services Ltd and never worked with them. In the UK, Vega is represented by Security Global Ltd, a security services vendor. The company’s website, however, does not mention cooperation with Vegacy Strategic Services Ltd. The British company did not provide an immediate response to our inquiry on their connection to Vega. Vega’s representative in Thailand is an individual named Aleksandr Vnuchenko. In 2009, he was allegedly suspected of stealing money from bank accounts. The suspects were arrested in the Thai province of Chonburi, where Vega’s Thai representative is now based. One of the arrested was Aleksandr Vnuchenko, a citizen of Ukraine. He did not immediately respond to our inquiry on his work for Vega. Apart from Moscow, Vega also has a branch office in Irkutsk, Russia. In Ukraine, Vegacy Strategic Services Ltd provides training courses for foreign vessel maritime security operators. The training is held at the Security specialist training center “Grampus” in Mykolaiv (where Anatoly Smolin, one of the company’s owners, was born), and at the International Maritime Academy in Odesa. One of the founders and the “public face” of Vega is Anatoly Smolin. He lists his birthplace as Mykolaiv, Ukraine. He studied at the M. V. Frunze Naval Academy. According to Smolin’s biography, he served in various units of the Soviet Navy and the KGB, and later as an officer in the Ukrainian Ministry of Internal Affairs mobile police units, such as Berkut, Sokil and the anti-banditry department of the Organized crime fighting directorate. In 1997 Smolin went to the private sector. In 2004 he became the director of security agencies “Alpha-Shield” and “Kolchuga”. As of March 2019, the Ukrainian company register lists two entities registered in Smolin’s name. Together with a foreigner Bruno Desire Alarcon [listed as Аларкон Брюно Дезіре/Аларкон Бруно Дезіре in Ukrainian registers] he owns a Limited Liability Partnership “Агенція Безпеки «Альфа-Щит»” (“Security Agency Alfa-Shield”), and also fully owns a Limited Liability Partnership “Vega Strategic Services” — a company with the same name as the one in Cyprus. In 2012, Anatoly Smolin took to internet forums to look for a Russian-speaking business partner in other countries such as Cyprus, Malta, the UAE, Oman and Sri Lanka. “I am fed up with lazy and irresponsible partners in Ukraine, I am interested in a fruitful partnership and expanding the company abroad”, Smolin wrote. We believe Smolin himself was in the group that trained Liwa al-Quds in Syria. A man who resembles Smolin can be seen in photographs published in a military news group on the Russian social network VKontakte. The photographs were deleted from the group, but remained in a tweet posted by Robert Lee, a Russian defense policy researcher at the King’s College London. We contacted Anatoly Smolin, but he refused to speak on the activities of Vegacy Strategic Services Ltd. “No comments!! !”, he replied (punctuation left unedited). We found another Ukrainian national who worked at Vega PMC. The Vegacy Strategic Services Ltd website lists two phone numbers as contacts for the Moscow office: one of them belongs to Anatoly Smolin, and the other — to Dmitry Dzhinikashvili from Odesa, who also posted an online CV that lists Vegacy Strategic Services Ltd as his workplace in 2013-2014. 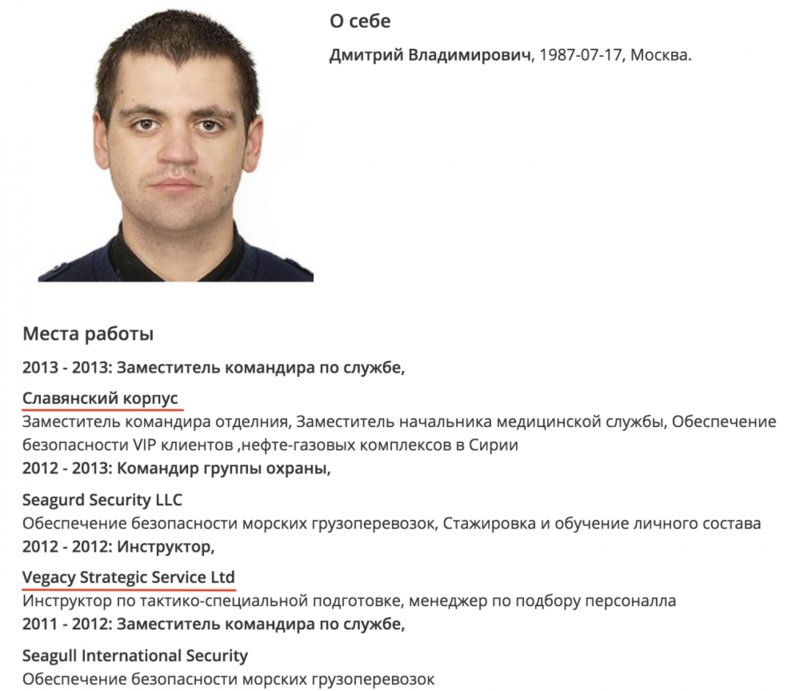 According to another CV, Dzhinikashvili worked at Vega even before that — in 2012 as a tactical instructor and a human resources manager. After that, in 2013, he went to work at Slavonic Corps LTD, where he “provided security to VIP customers and oil&gas infrastructure in Syria”. 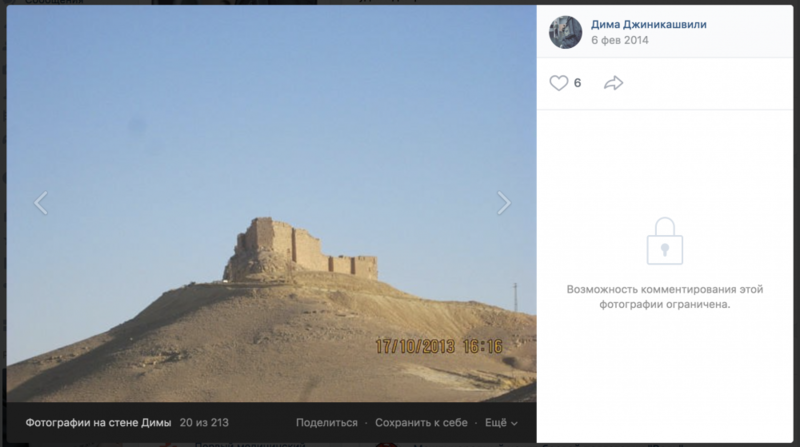 Dzhinikashvili indeed was in Syria no later than 2014, suggests a photograph of the Palmyra citadel posted to his VKontakte profile. In 2013, Slavonic Corps was the first attempt to send ex-Soviet fighters to fight for the Syrian government and protect oil&gas infrastructure in Syria. In 2016, Dzhinikashvili started working at a pro-Kremlin media outlet ANNA News as a cameraman, security and medical director. According to his CV, in 2017 he left the outlet. 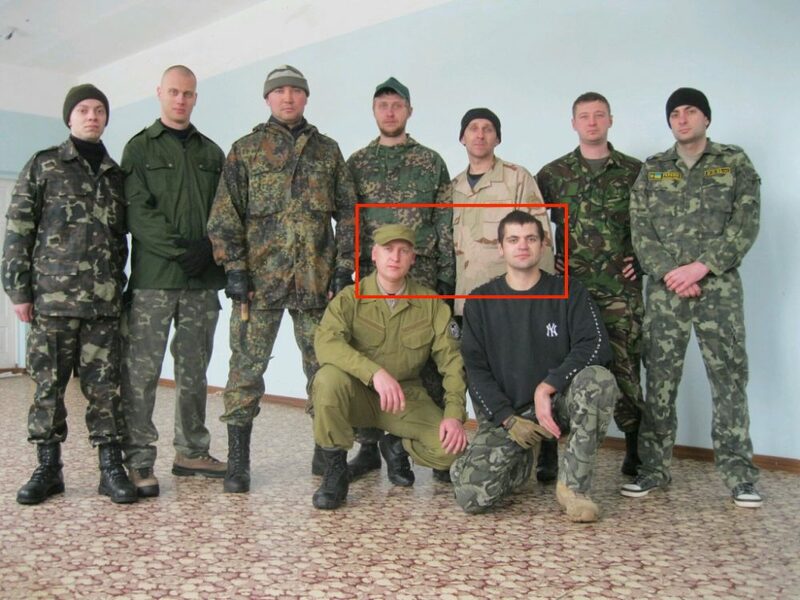 Oleg Blokhin, the person who published photos of Vega instructors training Liwa al-Quds fighters, worked at ANNA News until at least spring 2017. “The idea behind Vega was to present the first Ukrainian PMC to the international market. This had potential, as Smolin used to serve in the PDSS (Soviet/Russian underwater special forces — CIT). No one apart from the two founders (Kebkalo and Smolin) was involved in creating the company. Unfortunately (although maybe, in fact, fortunately) we had to part ways around late 2012. This decision was taken due to differing views on doing business. After 2012 we did not take part in joint projects. We know that Vega has relocated to Russia and is working in Syria. There are photographs on the Internet, made public for some reason we can’t understand. This is one of the reasons we parted ways. We do not do things this way at Omega. The company’s participation in projects like these should be more discreet, not posted on the internet for everyone to discuss. However. These photos do not prove anything by themselves. 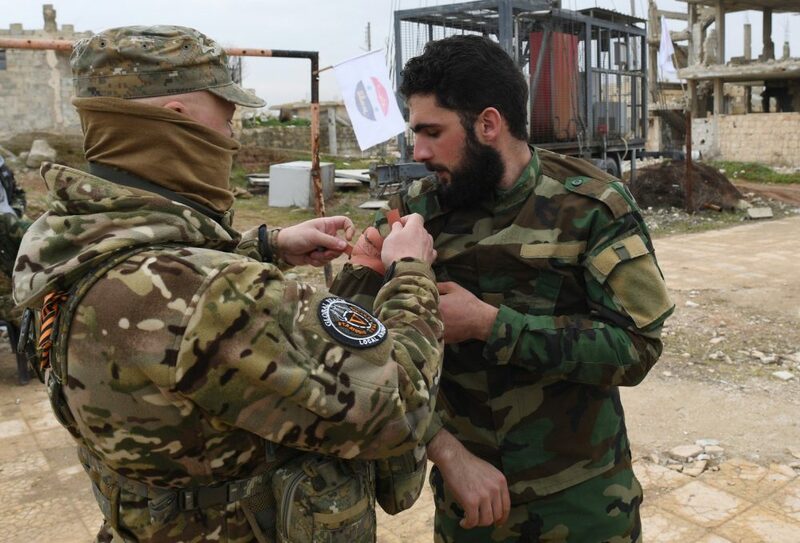 They may have just given some patches to guys working in Syria. 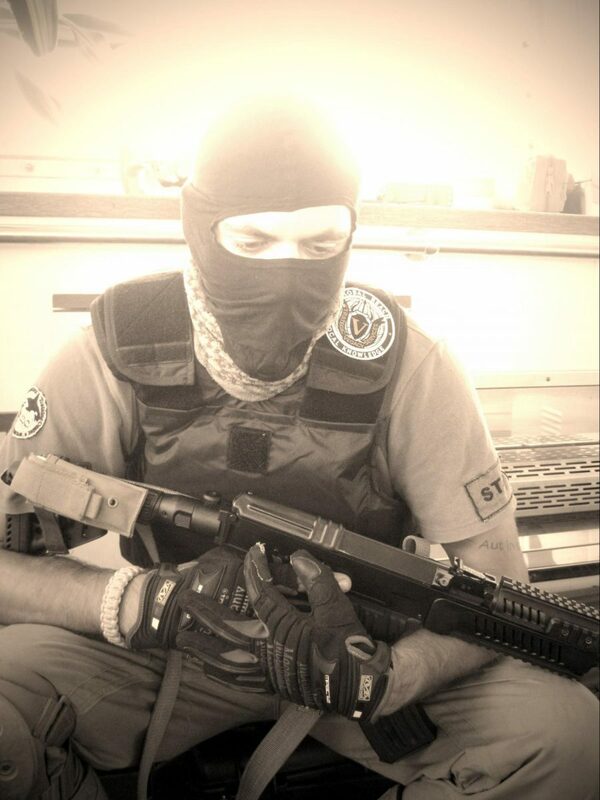 They plastered them to their sleeves and made it look like [Vega] was working [in Syria]. We have seen such cases before. According to our information, A. Smolin works at Legat private security company: http://legat-corps.ru/ this is not really a PMC, as their services are listed as security services to pharmacies, stores and warehouses” (punctuation left unedited). 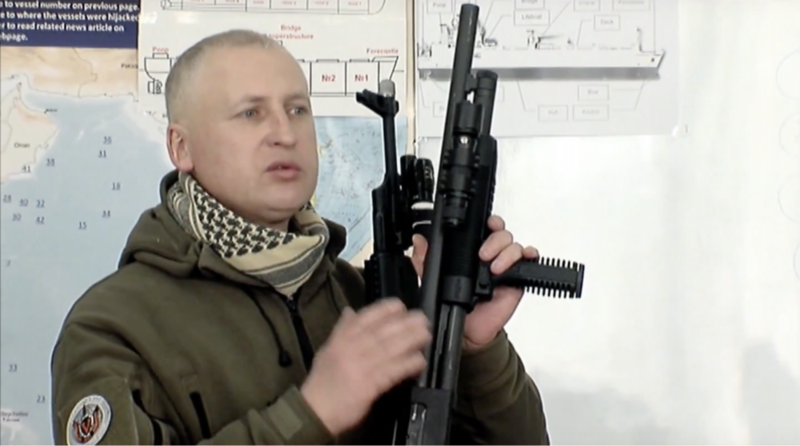 Kebkalo now heads Omega Consulting Group, a private military company he founded in the Ukrainian town of Slavutych. According to the description on Omega Consulting Group’s website, the company works on “increasing combat readiness of armed forces, improving the work of law enforcement and state security services, fighting international terrorism and simmering conflicts”. The company also has a defense department which consults the Ukrainian government and Ukraine’s foreign allies. The Main Intelligence Directorate of the Ministry of Defense of Ukraine is listed as one of Omega Consulting Group’s customers. The website also states that the company’s operatives fought in conflicts from South America and Africa to Crimea and south-eastern Ukraine. During public presentations, Smolin introduces himself not only as the founder of Vega, but also as the director of Legat LLC. Legat is effectively Vega’s Russian branch. We found the company’s website, where it is called “Legat Security Corps”. The website lists the same address for Legat’s Cyprus branch as Vegacy Strategic Services Ltd’s registration address. The Legat Security Corps posts job offers for security guards in Moscow, with clothing stores and a pharmacy chain listed among its customers. The website also says that the company provides security services abroad as well as in Russia. In other countries, Legat is involved in “mediating and settling conflicts, training government units and forces, and creating security systems in high-risk areas and regions”. Apparently this is the area of responsibility of Vegacy Strategic Services Ltd.
Vega’s Moscow branch (Legat Security Corps) works with non-state security and private military companies in Cyprus, Czechia, the UK, Belarus, Malta, Sri Lanka, Greece and South Africa, according to the company’s website. The adress of Legat’s Moscow office, also given on the website, allowed us to find the legal entity the company is registered to. The LLC “ChOO Legat” is registered in Moscow at Schukinskay street, 2. According to Kontur-Fokus company database, the company was founded in 2015 and is owned by Igor Stramilov and Valeriy Zasenko. Igor Stramilov is a Russian businessman known as the owner of Floria holding which owns the Floria pharmacy chain operating in and near Moscow. In one interview, Stramilov called himself a state security services officer. In another, he said that Floria’s holding owned an interregional security company. According to Kontr-Fokus, before 2017 Stramilov was listed as the founder of a Kolchuga Moskva LLC security company. Interestingly, Smolin worked at a company with a similar name: In his CV and on internet forums he wrote that he founded a Kolchuga security company — in Mykolaiv, Ukraine. 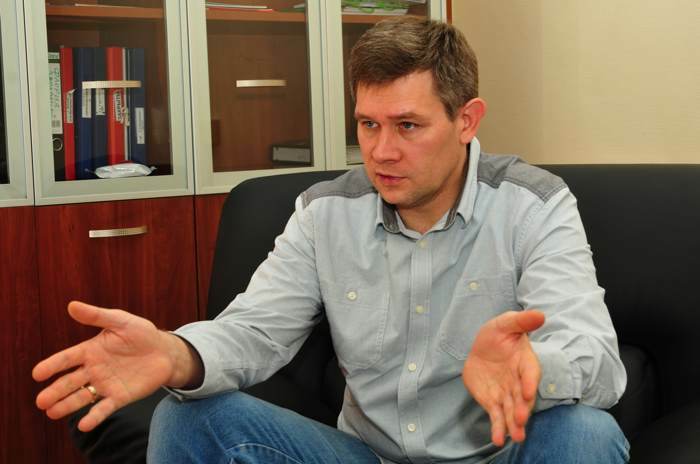 Igor Stramilov could be the other co-owner of Vegacy Strategic Services Ltd hiding behind shell companies. 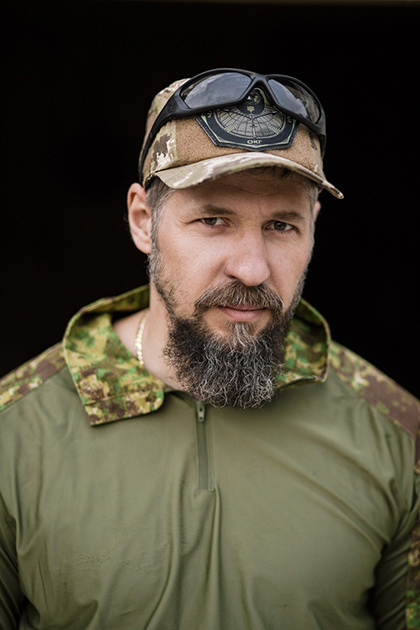 The only thing known about Valeriy Zasenko, Legat’s other founder, is that he also has a military background: he graduated from the Tomsk Communications Officers’ Academy. He is listed at the academy’s website among contacts of fellow students collected by another graduate. The e-mail address listed for Zasenko appears to contain the name of companies LLC Edelveis and LLC Edelveis+, of which he is a co-founder according to the Kontur-Fokus database. The Legat Security Corps did not immediately reply to our inquiry. 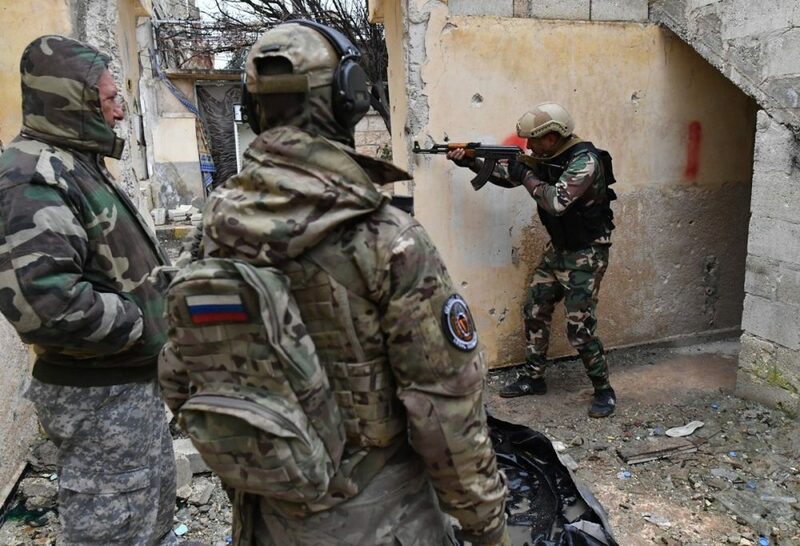 According to the company’s founder Anatoly Smolin, the PMC appeared in Syria in summer 2018. “Vega started its work in Syria with a serious event of national importance — the “International exhibition of industrial products”. […] By the way, on an invitation from the Syrian party, our experts together with the Syrian police provide security to the business forum,” Smolin told in an interview to Russian pro-government agency FAN. 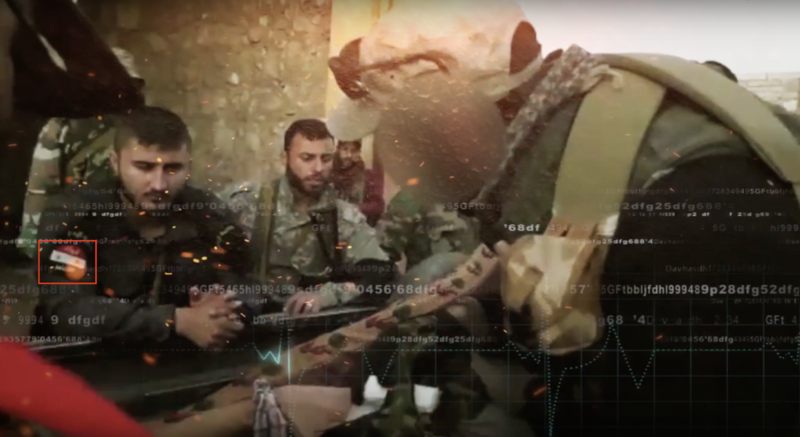 A Vega promo video published on the company’s website shows images from Syria, with Liwa al-Quds fighters on some. Vega employees are also seen at the fairgrounds of the aforementioned International Exhibition near Damascus, as well as in the ancient ruins in Bosra, southern Syria. The video also suggests Vega was part of maritime operations in Somalia. In July 2017, a Vegacy Strategic Services Ltd representative posted a job offer in a social media group of the Eastern Countries Institute looking for a manager aide and translator to work in the UAE, with responsibilities listed as working with documents, assistance to the manager at talks and official occasions, and translation services at training. Vega is, apparently, the first “classic” PMC, active in the international security market, which has been working in Syria with pro-government forces. Unlike the so-called “Wagner PMC”, Vega does not engage in frontline operations, instead providing training to government troops and security to key facilities — like their Western counterparts. 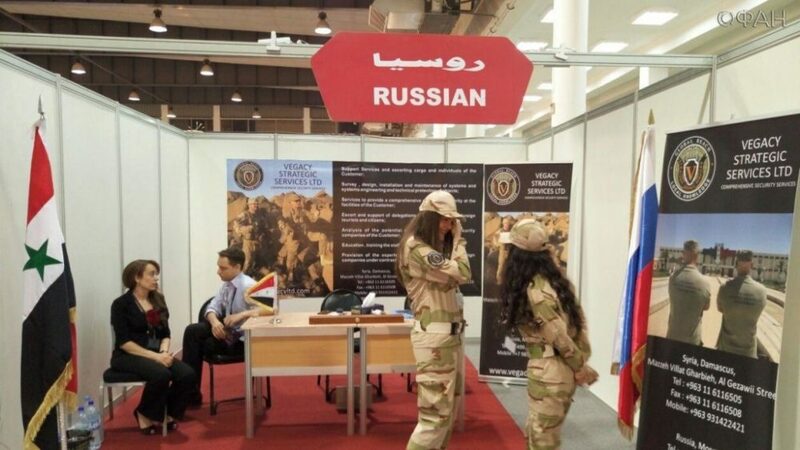 Their Liwa al-Quds trainees’ close connections to the Russian military in Syria suggest that the Russian commanders are at least aware of Vega’s work. However, it is currently unknown who funds this PMC’s activities in Syria. 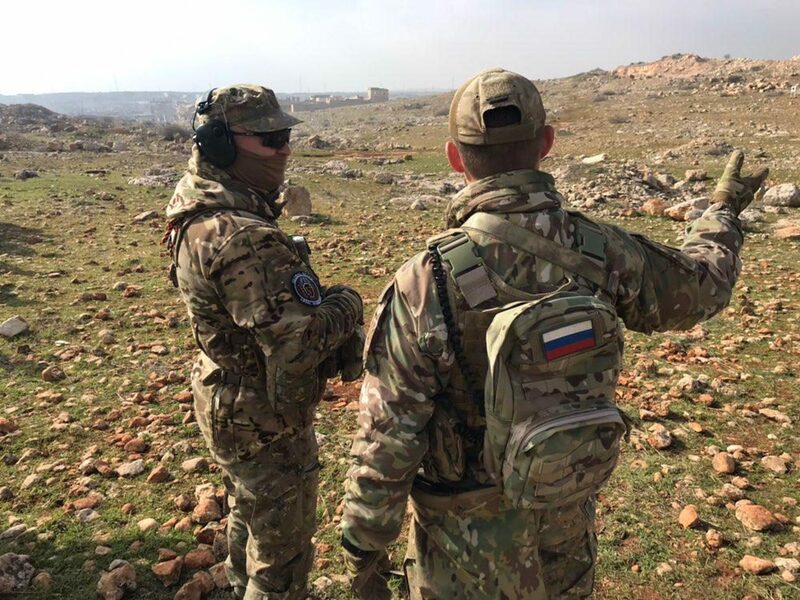 Ukraine’s Security Service (SBU) has claimed the photographs of “Vega PMC” instructors in Syria were faked and in fact showed “Wagner PMC” operatives. According to the SBU, the Ukrainian nationals Smolin and Dzhinikashvili left Ukraine before 2014 and were actively cooperating with Russian security services to provide mercenaries for Eastern Ukraine and Syria. Our investigation allegedly was paid by RIA FAN, an internet media connected to Putin-friendly oligarch Evgeny Prigozhin and his Internet Research Agency. We thank the SBU for the information provided. While we cannot confirm or deny Vega being a front for Russian special services, we can categorically deny allegations of cooperation with RIA FAN. We have not and will not work together with any pro-Kremlin media, We strive for unbiased reporting of activities by Russian troops and security services and are now preparing an investigation on Russian Special operations forces operatives killed while fighting in Eastern Ukraine.